The painting of the artist Mikhail Nesterov, called “The Solovki”, is now represented in the Hermitage. The north attracted the painter with its piercingly beautiful nature, however, the Solovki monastery was not chosen by chance, because here you can encounter another kind of beauty – spiritual. That is why the local elders and nuns became the heroes of his paintings of the Solovki cycle. 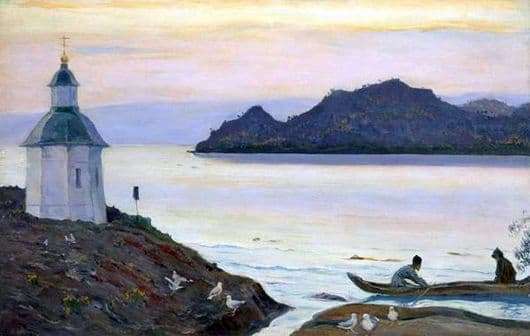 In the “Solovki” painting, people are depicted from a distance: the old man and a younger monk are sitting in a boat that is about to reach the shore on one of the islands. The large white-stone chapel is depicted. Nearby are the bustling seagulls that have become accustomed to the people on these shores. The second major object is a rocky island, which seems blue at dusk. And of course, the bottomless northern sky. It would seem, just a story painting, but it is also a true symbol of faith: the chapel in the picture as if rests with a cross on a golden shiny strip in the sky. Man here is perceived as a minor being, in relation to God, to faith. It was these feelings that Mikhail Nesterov was looking for, going to Solovki. And fate gave him not only a meeting with the extraordinary nature, captivating with its sad beauty, but also acquaintance with local people. The artist studied their customs, hoping to create an epochal canvas “Holy Russia”. But before that, no less beautiful and harmonious pictures were written, the last of which was “The Solovki”.